sights and sounds of Morecambe's beautiful bay. Led by Cedric Robinson, the Queen’s Official Guide to the Sands, the walks are about 8 miles long and usually start from Hest Bank or Arnside. Along the way, Cedric will explain about the bay’s wonderful wildlife, the marking of the routes, and the coastal features that you can see around you. 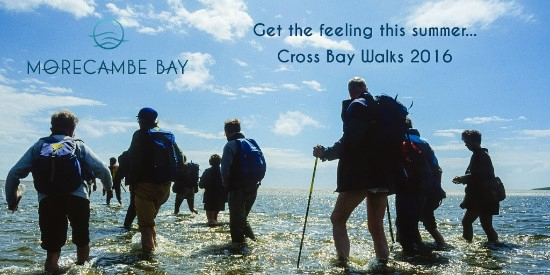 The 2016 Cross Bay leaflet features all the dates, booking details and some practical information required to embark on this unique and exciting experience. Pick up yours today from Morecambe Visitor Information Centre by calling (01524) 582808, emailing morecambevic@lancaster.gov.uk or download the leaflet. Copyright ©2015 Ashley Hotel Morecambe. All Rights Reserved.